Well, I'm getting terrible at sharing monthly updates on Carter. To make up for it, here are some cute videos of my big boy! Carter standing by himself at 9 months. Carter sharing his paci. Carter walking at 10 months! I can't believe he's already walking! Carter is getting less and less like a baby and more and more like a little boy! He just said "dada" for the first time a few days ago, and now here is a video of him walking like a big boy with his walker! Crazy! Where has the time gone?!? Carter and I had a big day today! I am on Spring Break and enjoying spending all day with my son! We are getting pictures taken of Carter on Friday so I decided that he needed a haircut because his hair was getting really long and wild. Even so, I was kinda freaking out about taking him to a salon because I wasn't sure how Carter would handle it since he had never been there before, and had never had his hair cut before. Well I worried for nothing! He did a great job. The booster the salon had didn't have a belt on it to strap Carter in, so I positioned myself right in front of him in case he decided to roll off, but he stayed put and didn't even try to move! He was happy the whole time, even with the stylist messing with his hair, and another woman (a customer!) taking pictures of the event for me! He would turn his head occasionally but for the most part did a great job facing the front (possibly because I was bribing him with puffs!). I thought for sure we would have had some tears or at least some apprehension, but apparently a haircut doesn't phase the boy at all! Well I DEFINITELY haven't had much time to sew since Carter came into our lives. 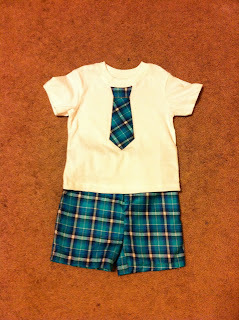 However, with Easter coming up I got inspired to make him a cute little outfit for warm weather. We have an adorable button-down shirt/sweater vest combo I thought would be good for Easter, but I decided to make another outfit as well in case this Easter turned out to be a warm one. Here it is! 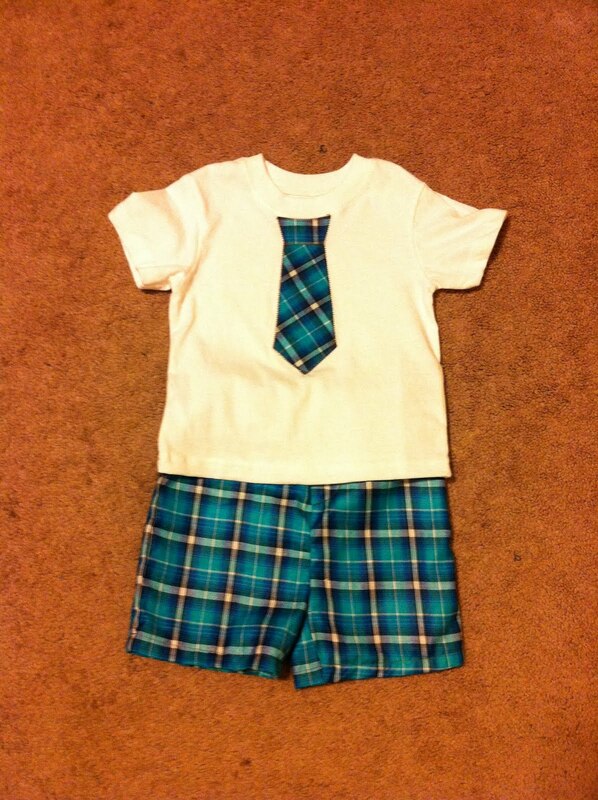 Yes...I know the plaid isn't even on the front, but oh well! The shorts drove me insane because the pattern I had was NOT very good, and I had to end up ripping out the stitching and almost completely re-doing them to get them how I wanted. I still haven't had a final fitting because Carter is asleep, but I'm keeping my fingers crossed! At least now if I want to make anymore shorts, I know what I need to alter about the pattern to make it work. Hopefully I will get inspired to make more outfits because I love the coordinating I can do when I make it myself. Well Carter has FINALLY figured out the crawling thing, and he's getting pretty good at it! He is also pulling up and "cruising" along some of the furniture. Here are some videos of the cute little guy! Well...so much for my 6 month post! Just know that he's gotten a lot bigger! That's probably all you need to know. 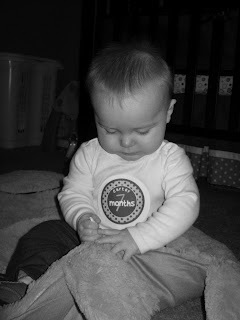 He is now 20 lbs 12 oz and 28" long; we need to buy a new car seat soon because the one we have only goes to 22 lbs. He is still a great sleeper, sleeps from around 7:30PM to 7:30AM. He does, however, decide to wake up at night occasionally and start fussing until I go in there and give him his paci. I will try to do as little as possible while in there, and he will go back to sleep as soon as I get the paci in his mouth. I just don't enjoy the small interruption to my sleep! Not really dying to try any "cry it out" methods though, unless it starts getting more frequent or he won't go back to sleep after I go in there. He is still a good eater and has 4 bottles every day and 2 meals of baby food. He eats a TON! He has gotten good at eating finger food, and now gets upset if I don't provide some finger food at every meal. He can eat mum mums, gerber puffs, cheerios, minced and cooked carrots, and pinto beans. He is good at chewing now as well even though he still doesn't have any teeth! I need some more finger food ideas, preferably that don't involve a lot of cooking! He is sssooooo close to crawling! He has FINALLY (today) started some forward movement, and even though it's not exactly crawling, it's definitely a step in the right direction. See the video below. In it I see at least 2 or 3 different versions of "crawling" that books say babies might use, so maybe he's trying to figure out which one works the best! Nate, Carter and I were all sick over the weekend with colds, but I took Carter to the doctor on Sunday when he kept fussing and crying for no reason. Turns out he had an ear infection (#3), and we got a prescription for an antibiotic, but we are waiting a few days to see if it clears up on its own. I hate giving Carter that many antibiotics when he is so young! He seemed to do a lot better today so he may not need it. We love our little guy so much and are so thankful for him! Contribute to our adoption fund! I'm 30 years old and have been married to my wonderful husband for 6 years. After finding out we couldn't have children, we went through the process of adoption. We have now been blessed with our handsome son Carter and couldn't be happier! Click here to buy coffee and we get a portion of every purchase!